Are You Geared Up For March Madness? Nope, the month of March is not only a time to get caught up in college basketball mania, it’s also a time to consider if you’ve, personally, “got game.” We’re about to transition into Spring; a natural motivator for change. Yet another opportunity to check in with yourself and perhaps, re-align. Admittedly of all the months in the calendar year, March is clearly the most vague month, no pun intended. It is technically still part of Winter and yet three quarters into it, the first day of Spring launches. The worst is behind us and although there might still be a chill in the air (or even a chance of snow), the sun is brighter now and we can sense that warmer days are just around the corner. This positive mental attitude provides us with the tools to combat the doldrums of what remains of the long cold winter. Sure, we are all going to have bad days now and then, but we know they are short-lived because the change of season is closer than further. So let’s get busy and changing our mindset before the Spring weather is upon us. Set goals NOW and visualize the end result. Have a plan to ensure that they are attainable. Think about what you want to accomplish this Spring that you did not follow through with last year. What tripped you up? If you have fallen off the wagon in regard to exercise, then get back to the gym today! Or maybe try something new and trendy? With the popularity of Pilates, Soul Cycle, and TRX suspension training, getting fit doesn’t have to mean a boring run on a treadmill. On that first gorgeous Spring day you’ll feel great about your mind, body, and soul, instead of regretful and disappointed. Organize your to do list NOW and evaluate it by prioritizing and creating a plan on how to attack one goal at a time. By giving yourself ample time to mentally prepare, you are giving yourself a fighting chance to accomplish at least some of your goals. Put thought to paper, so you have a concrete plan. This is an excellent motivator for making you more accountable for actually doing it. Too often, we procrastinate until we are overwhelmed with too much to do, and so nothing gets done at all. Don’t wait for Spring to pop up and catch you by surprise, then realize that it came and went and you never cleaned out the garage. Trust me, before long it will be Summer and you know you won’t be able to resist the pull of the beach. You’ll be thinking…there’s always tomorrow ! Get a jump start on your Spring goals. Make March your month to literally Spring forward with intention. If you can make a connection with the change that’s in the air, it is likely to inspire a change in YOU. So get motivated, and at least, try to change something. Take a shot. 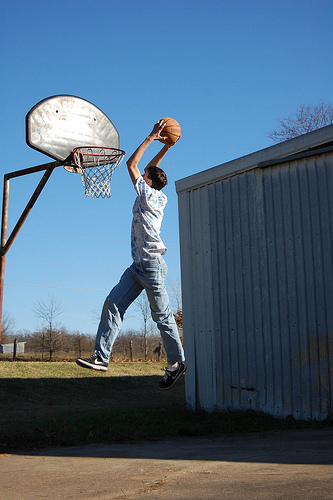 Catch the“March Madness” and find ways to achieve your own “slam dunk” moments. Make it your own kind of frenzy. Game on! Growing up with “do as I say, not as I do” was confusing. When I think back to my childhood (boy, am I’m aging myself), I can remember my parents smoking cigarettes, but forbidding me to ever try; I recall their using inappropriate language but threatening to wash my mouth out with soap if I ever did. Don’t get me wrong, my parents did a stellar job in raising my brother and I, and we had a wonderful childhood, but perhaps they weren’t paying attention to the fact that we were indeed watching. We understood at a young age that we shouldn’t model their bad behaviors because the natural instinct for any parent was to protect their children from harm’s way. They only wanted the best for us, but as children, we only wanted to grow up and be just like them. So we absorbed it all; a blend of both good and bad traits. When my children were small, sugary cereals and snacks, fast food, and carbonated drinks were daily indulgences for all of us. Twinkies, devils dogs, and Hostess cupcakes were family favorites. I reflect back with tremendous remorse (and huge dental bills to show for it) and question myself if it was ignorance, bad parenting, or both. But in my defense, health and nutrition were not held to the high standard that they are today, and back then every kid seemed to be romping along in happy candy land, on a perpetual sugar high. It was a repeat of my own childhood. Now with the trendy rise of wellness and fitness consciousness, I have noticed a new generation of parents who are paying closer attention to healthy living. 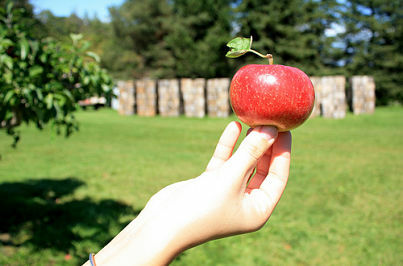 No more apple juice, soda, white bread, or unhealthy snacks. But they too, are making healthier choices, and living more wholesome lives. They are leading by example. The ultimate challenge of successful parenting is being a positive role model for our children through our actions, because they really do speak louder than words. Instilling good values is so important but we must demonstrate them, not merely preach them. Teaching them to think for themselves, to make mistakes and learn from them, and be accountable for their actions are only some of the key ingredients for their success. These are sustaining life skills that they will utilize as they navigate through the world. Our objective is to prepare them for the many challenges they will face by providing them with the proper tools. Undoubtedly, parenting is one of the most difficult roles we take on. There are no tutorials or standard manuals, and there are certainly no guarantees that great parents produce great kids. If you’re a bit messy and your clothes are strewn all over, don’t be surprised that your kids aren’t putting their toys away. It’s not their fault their things don’t have proper homes, it’s yours. Teach them about the benefits of being organized. It’s an essential tool they will utilize the rest of their lives. If you’re generally harried, disorganized, and struggle with punctuality, your kids are likely to miss the bus or be late for scheduled appointments. Or worse, just struggle with time-management in their adult lives. If you are a compulsive couch potato, perhaps your child will also prefer TV over other activities. Likewise, the avid reader will most likely encourage their children to enjoy reading too. Monkey see, monkey do. If you are not eating healthy or exercising regularly, they probably will be less inclined to do so for themselves. If you don’t recruit your family to help and share household responsibilities, they will not learn these skills. If you don’t use kind words and manage your temper, don’t expect your children to respect others. Don’t be shocked if they don’t play nicely with others. If you don’t set parameters, the lack of discipline might impact their adult life. Unquestionably, “the apple doesn’t fall far from the tree.” Children are so impressionable, so impress them. You are their role models so model good behavior. Lead by example. Plant those good habit seeds early, they will blossom well. Influence. The goal is to nurture and protect your child, yet foster independence and self-esteem. Teach them well, love them hard, and they will thrive. As parents, one of the most gratifying jobs is to aid them in reaching their fullest potential. If you can do that, your work is done. You will have succeeded. How would you measure success in your children? Ever wonder what kind of parents your children will grow up to be? Hmm…that could be very telling. At the end of the day, it doesn’t make a difference whether our kids turn out to be exact mini versions of ourselves, happy hybrids, or completely unique. It only matters that they’re good apples. And the secret to that my friends, is all in the seeds. Do you find yourself repeating the same bad behavior? Are you stuck in bad routines? There is something oddly comforting about sticking with the same old routine, albeit a poor one. We simply don’t have the time to analyze our every day so we merely continue to repeat the old and familiar patterns. Ahhh…imagine if we only had the time. Think for a moment about the possibilities of making the time to change the habits that are no longer working for you. If you are feeling stressed and overwhelmed with your life schedule, maybe you can identify with the following likely symptoms of a bad routine. 1. Your morning routine is actually not a routine. No 2 days are alike. 2. Most mornings you feel rushed and continually search for the same items prior to exiting your house. 3. Typically, you are jumping in for a quick shower instead of enjoying a leisurely one, and time to gather your thoughts for the day. 4. The kitchen sink seems to be always full of dirty dishes and the dishwasher is always full of clean dishes, not emptied. 5. Your solution for not hanging up your clothes is failing because every back of a chair, banister, couch, and treadmill is already over-utilized. 6. You don’t ever schedule a meal. Hence you eat whatever, whenever. 7. You don’t have time time for the things you enjoy because you are too busy with the “have-to’s”. 8. Coming home at the end of the day, you feel a more heightened sense of anxiety, rather than a place of sanctuary. 9. Increased tension by the end of every week. Of course if these are your routines and they work for you, by all means, stay with it. No need to fix what’s not broken. But if you are frustrated and unhappy with your daily routine, you must make it a priority to implement some change. Can you eliminate one thing you do every day that is counterproductive? Can you find a way to make a “have-to” more enjoyable? Can you modify the way you manage your time? All routines have a time-management component and so if any of these symptoms resonate with you, it’s time to adjust how you use your time. Here’s the simple tip; Always allow yourself more time for everything. It is an effective stress reducer. Think about your day the night before. Prepare. Do something that will make the next day run more smoothly. Rise earlier, more wiggle room. Time to breathe. Have the nice long hot shower. 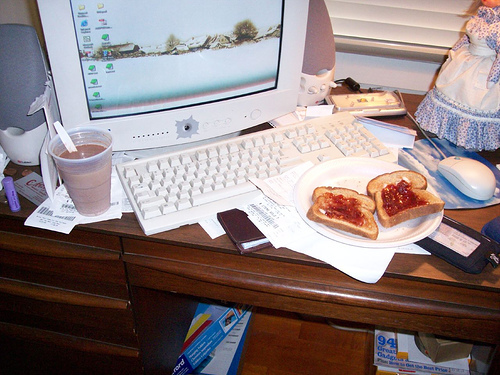 Make the time for a healthy breakfast. Have a plan for the day. Follow through the entire day, including meals. It could mean defrosting necessary food, purchasing ingredients for the dinner menu, or making a reservation! It doesn’t really matter what the plan is, just have one. At the end of your day, hang up the clothing immediately because they won’t hang up on their own. They will still be there tomorrow and beyond. Avoid letting them accumulate. Ditto to the dishes. It’s a goodhabit to change bad behavior. Give yourself a break today and break a bad habit. Each Spring is punctuated with the joyful celebrations of both Easter and Passover. Granted, all holidays have beautiful traditions and rituals, but Passover in particular, is unique in its own fashion. It is one of my favorite holidays, albeit extremely laborious (especially if you’re observant). It is rich in tradition, history, and customary laws and it requires a heightened sense of organization. Naturally, as a Professional Organizer by trade, and as a person who loves to pay attention to detail, this holiday speaks to my heart. The very first Passover took place in Egypt thousands of years ago and many consider it to be the most beautiful of all holidays. It is the oldest holiday on the Jewish calendar. The Passover Seder brings together families and friends who eat, drink, and sing together, while reciting the old-yet ever new-story of the Exodus from Egyptian slavery. The level of observance may vary, as some must kosher their entire home and kitchen to invite the holiday in. Having a separate additional set of dishes, pots, pans, and utensils to clean, are often a part of this change-over process. Many households consider this transition the opportunity for their grandiose Spring Cleaning. And yet there are others that simply prepare a festive meal without the need to make it such a labor intensive prep. There is a wide range of observance, for sure. But regardless of how you welcome Passover, it is safe to to assume that a typical Passover Seder always involves family gathering around a holiday table reciting from the traditional Haggadah and celebrating this festive holiday in very similar ways. The Judaic translation of Seder, means “order”, and so there are specific foods eaten at specific times prior to the main meal. There is a set order for everything that happens during this time. The Seder Plate sits at the head of the table (generally in front of the Leader), displaying the five foods that all have a symbolic reference to the tale of the Jewish people’s freedom from Egyptian slavery. Each guest has a copy of the Haggadah. Supervised by the leader, all guests participate in responsive readings from the Haggadah and once reciting the prayers in unison, all eat the special traditional foods at the same time. There is an obvious sense of an orderly agenda that is being methodically followed. “Haggadah” means to “to tell” and that is the purpose of the Seder; to tell the dramatic and exciting events that Passover recalls. It is customary to re-tell the story of the Exodus of the Jewish people from slavery, and pass it on from generation to generation. Make no mistake about it, the preparation for the Seder is extensive and detailed. 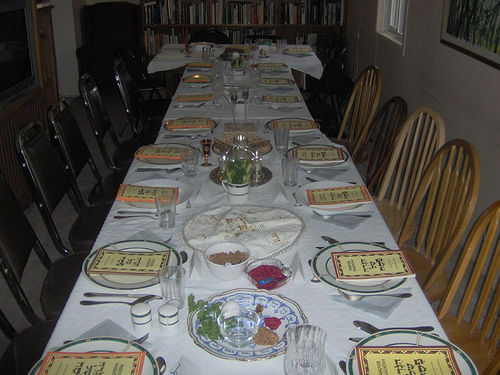 The duration of the ceremonial portion of the Seder meal may differ from family to family. But regardless, the responsibility falls on the hostess, who is required to coordinate the entire schedule and manage the service of the meal. Timing is key. The matzah ball soup MUST be hot, the brisket should be carved ahead of time, and all the side dishes should be landing on designated platters, ready to go. If you are not organized, this could go badly. Hopefully, there are happy helpers available to refill the wine glasses, clear and reset the table for each course. From year to year, I save my notes on menu choice, recipes, guest lists, etc. In this way, I can recall what worked and what did not, and make adjustments for the following year. A good practice for any holiday planning. There is something beautiful to be said about that wherever you are in the world, those observing this holiday are all following the same order of practice. There is little deviating. The Seder Plate is prepared with the same components throughout the world. This Jewish holiday unites people in a way that no other does, because it is organized in the exactly the same manner. This dinner is like no other ordinary dinner. There is a definite pace that is controlled by the ritualistic practices and the re-telling of the Passover story. The customs are abided by in the same order. 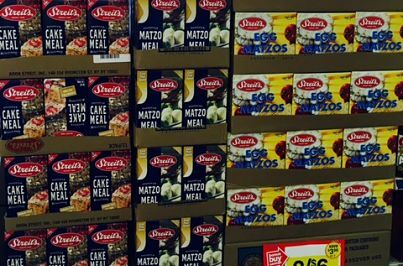 And no matter how the menu varies, you can be guaranteed to find a box of matzah set on every table. Everywhere, families are singing “Dayenu” in the same tune, one voice. It is essentially the same in any country you travel; consistent and repetitive. It’s something to look forward to each and every year. No matter your religion, adhering to certain rules and customs may seem confining but I believe it connects humanity. We all need structure and parameters. During this holiday, we are restricted with our diet, and are forbidden to eat leavened bread. Like anything else, once deprived, we learn to appreciate our freedom more deeply. We are grateful to be free from tyranny and we are happy to return back to normalcy at the end of the holiday. One of my favorite Passover delicacies is the “Charoset,” which is a mixture of nuts, apples, wine, and cinnamon. During the ceremonial portion of the seder, we dip this with a leaf of bitter romaine lettuce. What we glean from this is this…life is bitter-sweet . The sweet and pleasant taste of the harvest impresses upon us that, no matter how bitter and dark the present appears, we should hopefully look forward to better days. Nice take-away. Do you have a favorite holiday that aligns you? Do you prepare and plan for it? How Are You Managing the Holiday Havoc? It’s that festive time of year again, and for most, a very busy and hectic time. We all have so much on our plates. But guess what? Despite the challenging economy, the holidays are still coming. Some of us may resist jumping in just yet, but eventually, we all get captured by the holiday spirit. No doubt about it, holiday mania can be very overwhelming and stressful. Let’s see…we have Chanukah and Xmas presents to buy for our friends, family, and business acquaintances. Add to the list, the local favorites, i.e. manicurist, hairdresser, postman, etc. ), or perhaps a favorite teacher or receptionist. Additionally, you might have a secret Santa grab bag to buy for a business or social event. And whether it be business related or just casual gatherings, there are holiday parties everywhere, which may inspire you to shop for some new and trendy party clothes. Ugh, humbug…are we done yet? Nope, not quite. But don’t stress. Holiday Shopping: Go home, make a list. Jot down the friends, family, etc. for whom you need to buy gifts for, estimate how much you’re going to spend for each, and carry it with you while shopping. Have an agenda and destination in mind (on paper, or smart phone) before you go shopping. Without a list, you can get easily distracted and side-tracked and perhaps be in danger of buying something you don’t need. If you stay on task, you won’t be shocked when the credit card bills arrive because YOU managed it. Chances are, if you have don’t have a specific person in mind on a list, you will find yourself roaming aimlessly for hours and most probably exit, confused, distraught, and empty-handed. 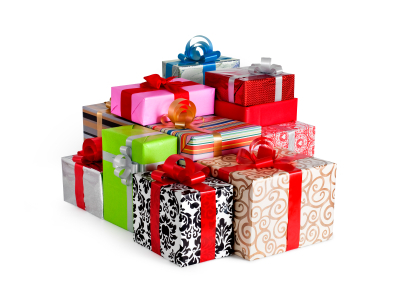 Holiday Gift Wrap: Let’s address all the wrapping paper, ribbons and bows already in your inventory. They can create a huge mess if not properly organized. Consider all the new incoming wrapping paper. Those little gift cards (or stickers, even better) are a MUST for labeling the gifts, especially if you want to ensure that Aunt Shirley doesn’t get Uncle Ted’s tie. Manage the chaos by labeling everything, and create a gift list so you can keep track for next year too. There are convenient wrapping paper storage containers like this one to organize your holiday wrapping all year long. Perfect for a top shelf or under the bed access. http://www.containerstore.com/shop/giftPackaging/organizers?productId=10006022&green=FF8CD23A-BBE1-5CF3-943C-70A097BD5197 There are many more options available at the Container Store. Holiday Decor: Start early. Hopefully you have some kind of storage system already in place for retrieving all of your holiday decor, so the prep won’t be that crazy. But if you’re wondering where you put your favorite tablecloths, Chanukah menorah, or tree ornaments, this could be a stressful process. But it need not be. Change it up this year and purchase storage bins for your inventory and box them with “like” categories, and label the contents. Designate a consistent spot in a closet, garage, or attic. Next year will be a breeze! Holiday Entertaining: If you are hosting, I’m guessing you are frenzied with the endless amounts of money exhausted on holiday decorations, party goods, table settings, home decor, food, etc. Plan your menu ahead, and create a detailed shopping list to follow. Visualize the actual dinner table and backtrack on how to create it. Break it down into smaller steps so you can maintain control throughout the planning and minimize last-minute anxiety. Write it all down so it is out of your head and onto a piece of paper. It’s so easy to forget the simplest things when your brain is over-burdened. Be a smart shopper and buy decorative holiday decor that will endure another season. Pack it, preserve it, so you can store it away in your new storage bins. Even if you are not hosting, there will additional spending on bringing a hostess gift, cooking a dish, baking, or purchasing some delectable pastry. Plan for it and schedule it to happen. Avoid the multiple runs to the liquor store (for that person you forgot to buy a gift for) and keep extra bottles of wine or vodka handy. Be prepared. FYI, alcohol is the gift no one ever returns, lol. Holiday Travel: And if you are one of the fortunate ones that are also packing for a Xmas vacation with the family, it will require an even greater sense of organization. The key to getting through all this merriment without having a meltdown is doing just what Santa does…making a list, jotting it down, and checking it twice. Yep, lists, lists, and more lists. Better still, devise a standard checklist to refer to for all future travel. Holiday Parties: These are the fun things to keep track of, so keep an organized calendar and mark down all the dates you want to schedule in the month. Set up reminders to alert yourself to respectively RSVP and avoid double-booking. Of course, there will be some parties you’ll want to go to, and others you’ll have to attend. Prioritize and check off as you go. If you’re on a budget, shop for clothing that can cross over for both business and casual attire. Organize your holiday. Manage your time. Prepare by sticking to a daily plan and prioritizing tasks. Decide this year to make the holidays both joyful and productive. Be merry, not stressed. You choose. © 2010 Move the Mess. All Rights Reserved. Nancy@movethemess.com 1-516-458-0324 Powered by WordPress & MacPress by Sizlopedia. For those of us that live in parts of the country that have four seasons, what sadness transcends at the thought of another summer exiting. But the truth of the matter is that a change of season is a natural motivator for actual change. Some of us welcome change and others don’t fair as well, but regardless, the seasons will inevitably change in spite of our kicking and screaming. Whining about summer’s end accomplishes little, but recognizing the benefits can be fruitful. In fact, it is an ideal setting for re-organizing our behaviors. 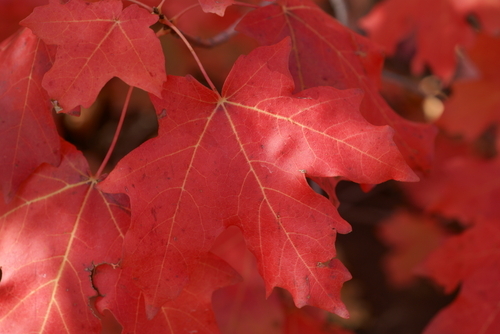 When we transition into a new season, it is a perfect opportunity to rethink the past. The four seasons punctuate the cycle of a full year by the changes in our activities, the clothing we wear, the places we go, etc. But those are not the only things that might change. Think about a change in season like an automatic reset, and when we can sense the physical change, it is likely to elicit an emotional response that syncs to both our personal and professional life as well. We must prepare to adapt to a new season and for the change it brings on. A change in season is like a wake-up call to modify our daily life. Time to put away the summer clothes and organize your Fall and Winter wardrobe. 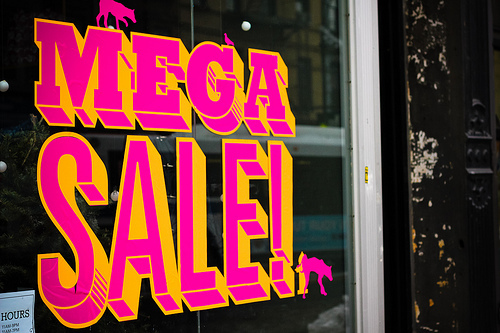 Do you need to buy new clothes because you’ve lost or gained weight from last season? Did you cultivate new relationships or did some fizzle like the summer’s end? Can you visualize your current relationships and associations enduring through this next season? Does the thought of another Winter at the same job depress you? Evaluate. Re-think. Change. Time does not stand still, it marches on and so should we. Change is in the air, we can all feel it. Embrace the brand new season. What things are you ready to change?